← A Higgs boson concealed in your award! Any one who has walked the streets of the Latin quarter in Paris knows about the special reverence with which the French treat their scholars. The streets carry the names of no other but Laplace, Fourier, Monge, Poincaré, Curie, Perrin, Becquerel, Gay-Lussac, Pasteur, but also Balzac, Montesquieu, Voltaire, and Hugo, among other giants of mathematics, the sciences, arts, and literature. There is no NorthWest 55th street in Paris. Now try to take a stroll nowadays in the “rues de Paris” with Cedric Villani, and you will notice that this reverence (adulation?) continues. You will be stunned to see how many people stop him in the street to seek his autograph and to be photographed with him. It is true that Villani has just received the prestigious Fields medal last August in Hyderabad, India. But Villani is not like any other Fields medalist. He is a star! Unlike other winners of this prestigious award (remember Grisha Perelman, the one who said no to $1-million? ), Cedric is the poster boy of mathematics, the extrovert, the showman who is on a mission to break taboos and change stereotypes. Ever since he was awarded “la medaille”, he has appeared on essentially every French TV and Radio shows, newspapers, magazines, often on their cover page. His now familiar hair style is starting a trend among Parisian wannabe nerds. Villani is as comfortable lecturing at the Institut Henri Poincaré that he directs, as talking about knot theory in the high fashion houses of the Rue du Faubourg Saint-Honoré. I remember teasing him –while waiting together at the Porter terminal in Toronto– about having to deal with his incognito status now that he was on Canadian soil. “You have no chance in the land of Don Cherry. The only widely recognized (mad) scientist here is Doc Brown from “Back to the future”. I was shocked soon after, upon returning from a cell phone break, to see him mobbed by 3 lady passengers… They were simply admiring his spider “broche”, one of many he always carries in a bulky box that puzzles airport security everywhere, and causes painful delays. Villani is a true gift to mathematics. He is surely the run of the mill workaholic mathematician, who doesn’t shy away from producing a 1000 pages+ book in no time. But he is much more. He is directing one of the most prestigious institutes in the world, he is in constant contact with the “conseillers de Sarkozy” about matters that concern every scientist. He doesn’t only care about invitations to Princeton, Berkeley and Cambridge, because he is also keen on giving sustained summer schools in Benin and Birzeit. Intrigued by the AIMS initiative and Canada’s $20 million contribution to its emerging network of African mathematical institutes, he insisted that we go see Neil Turok at the Perimeter Institute in Waterloo, so as to coordinate efforts and involve the French government in the initiative. 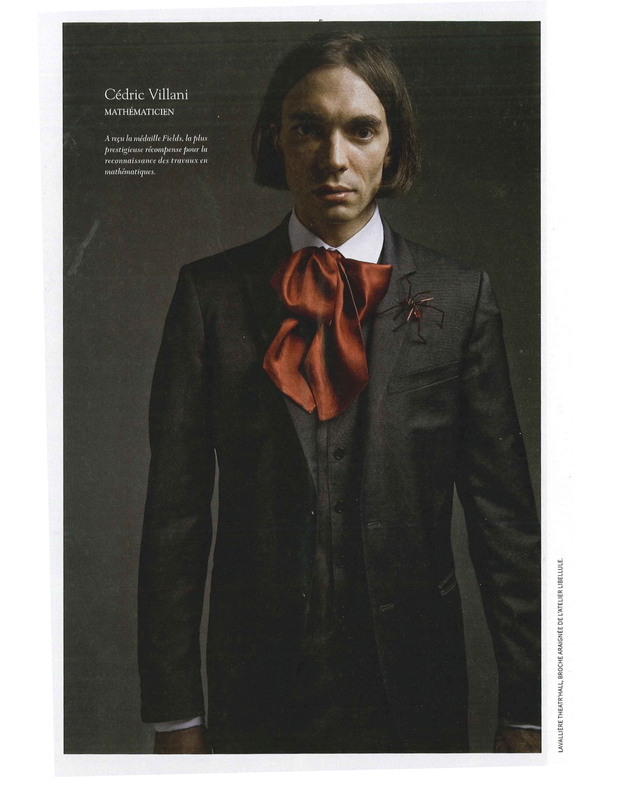 Cedric Villani is a star and a bright one!